“The girls had an excellent time and have recommended Mayo to anyone who will listen! The trip really has made such a difference, both to their education and personal development and it is something that neither we nor the students could afford without Mayo Association Dublin’s generous scholarship. Again, many thanks from all here at Mount Carmel,” noted Eoghain O’Brien, Mount Carmel’s Irish teacher (who hails from Mayo). 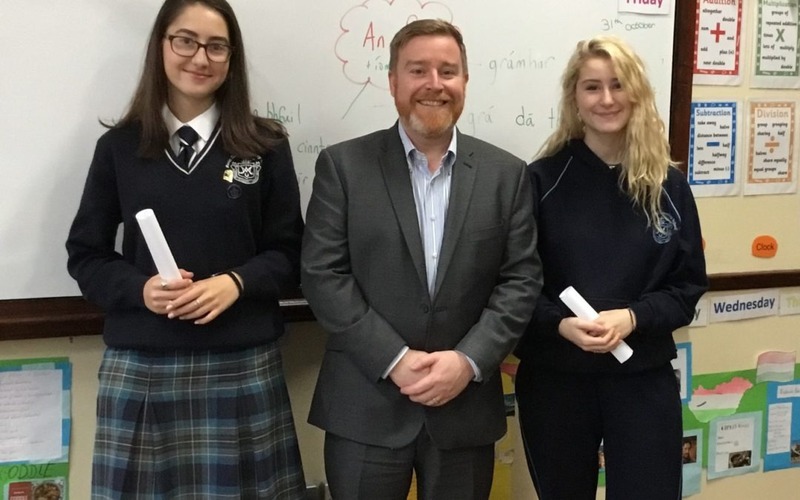 Aisling Incze and Diana Mare (pictured above with school principal Gerard Cullen, who presented the sixth-year students with their Gaeltacht sponsorships) give some feedback on their two-week stay in Belmullet – ‘as Bearla’ and ‘as Gaeilge’ of course! Aisling Incze: “I thought it was excellent! It was wonderful to meet with so many new people. I particularly loved the sailing and I greatly improved my Irish. It was a fantastic experience overall and I would love to return to the Gaeltacht again. I had great craic and it was very worthwhile!